thesupergreat: I Want My Money Back! Wow, if last week's experience didn't convince me to fully ween myself off of LivingSocial.com, I don't know what will! A few weeks back, I bought a massage deal at a Health Center with a Zen-like name. It included an hour long massage and a wellness consultation. Sounds nice right? WRONG! The Center was not at all what I imagined it would be. There were no Zen sand gardens or Buddha fountains. 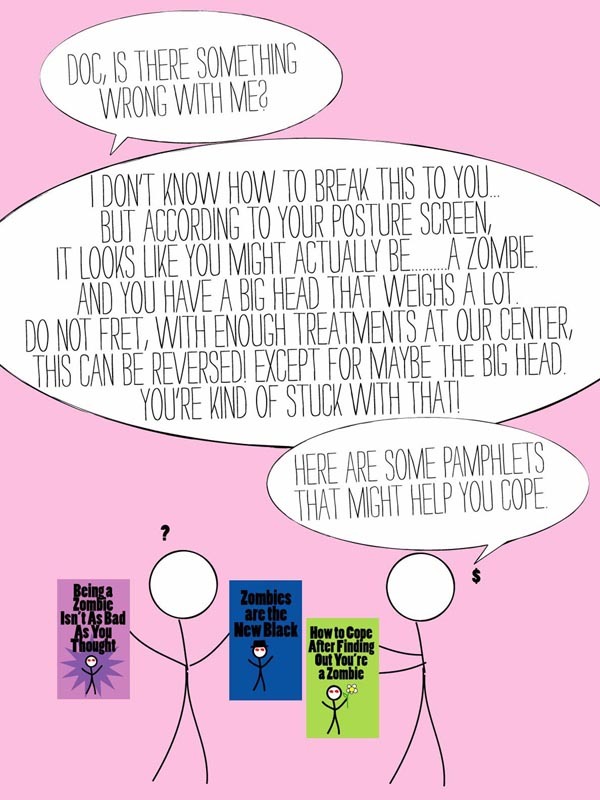 When Dr. Charming McConvincerson examined my posture, he pretty much told me it was a miracle I could hold my head up at all (apparently, the angle of my spine is causing my head to feel like it weighs 37.6 lb!) and possibly the only way I could save myself is to buy a whole lotta (most likely pricey) sessions at his center. Thank god I found him in time, before it was too late! Instead of feeling relaxed and renewed, I left there feeling like a hunchback ogre with no hope of walking upright for much longer. 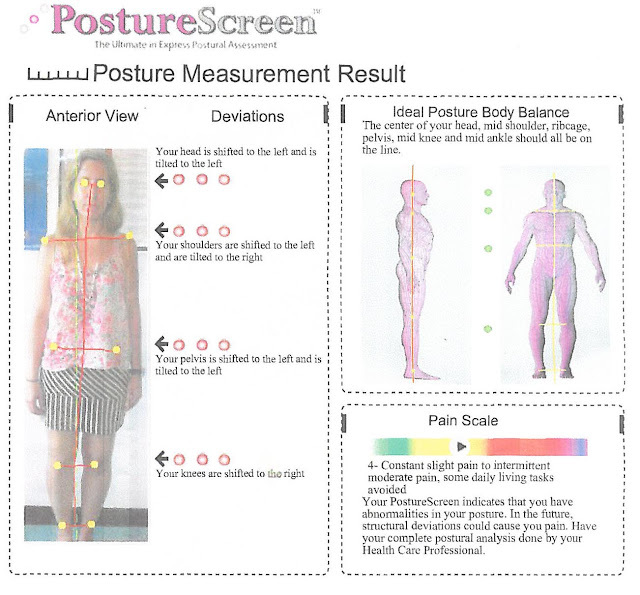 Take a look at my "Posture Screen" below. Can you believe I go out in public with all that misalignment? After a desperate consultation with a reliable doctor, I was reassured and consoled. There is a small possibility I am just fine as is, and this might just be a money making scheme that I got roped into. Thanks a LOT, LivingSocial.com. The next time I get an annoying chain letter in the mail, I'll be sure to send it to you! Sam or Zombie Demon? You decide! I dream of one day having the "Ideal Posture Body Balance"! Haha!i know! While I was there, they had me so convinced! I was like "SAAAAVE ME DOCTOR!! I can't believe I've been walking around like this in public! Thank god you and LivingSocial.com walked into my life when you did! NO WONDER I'M STILL SINGLE!!" I want to read about how to cope with being a zombie! Oh wouldn't you just. Haha jk, i don't know what that means... Just trying to sound sinister!